Here is a compilation of my favorite iconic tourist attractions. The good news is there are so many great things to do in New York today that there’s enough to go around. This is part 4 of a series of four visual stories. Riding all the way across the Brooklyn Bridge is not just about crossing a bridge. Every single step towards Brooklyn (from Manhattan) – or the other way around – offers a new possibility to explore views of Manhattan, Brooklyn, Statue of Liberty, One WTC and Lower Manhattan, Empire State Building, and the bridge itself. You have to cross the Brooklyn Bridge before the sunrise, at noon, to watch the sunset, in the middle of the night – at 3 a.m. Be creative to live this amazing adventure of scenic views, architecture and history. For each one of these walks, you will have different stories to tell, different and fantastic photos to share, different moments to keep to yourself. I put this visual story together to share my own vision of this iconic bridge. Enjoy some great pictures, and some of its secrets. 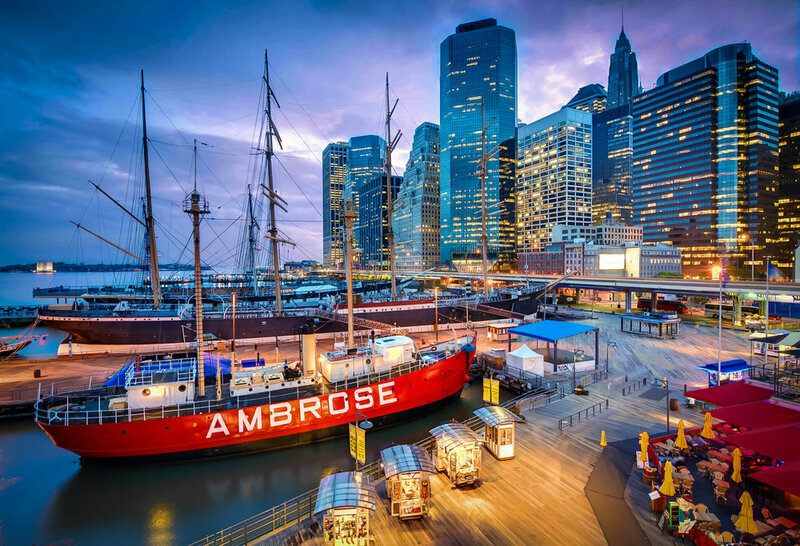 The former Fulton Street Market building at Pier 17 was rebuilt as a high-end shopping mall in the early 1980s, but if you’re looking to avoid throngs of people, we suggest detouring to the pier itself, where you can check out the largest privately owned fleet of historic ships in the country. Afterward, hit one of the area’s surprisingly decent drinking & dining destinations. Think about an oasis on the waterfront. Fresh breeze, relaxing atmosphere, breathtaking sunsets, excellent views, surrounded by a peaceful vibe. The best part is that this mini-paradise is just 2 minutes away from Grand Central Terminal. That's Long Island City, just one subway stop from Grand Central Terminal. It is a sprawling area bounded by the East River on the West and Newtown Creek (Williamsburg, Brooklyn’s border) on the South. From that spot, you have some of the best views of Manhattan. Sunsets are stunning at the LIC Piers, as well as the beautiful ballet of lights that goes from natural sunlight to the contour of Manhattan’s silhouette.